At the very beginning of hardware construction, all biological products and other auxiliary reagents (like Au nanoparticles and Nafion) have to immobilized on the electrode. To meet the need of large-scale manufacturing and high accuracy, we used a 2D printer to print these materials onto IDEs ( InterDigital Electrode) to modify the Au-surface. 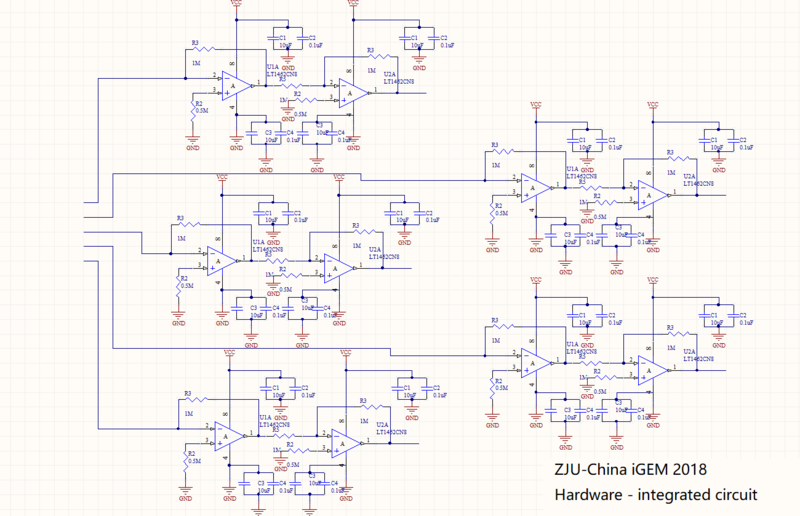 Then we assembled IDEs, amplifier, convertor and digital interface to an entire circuit. The signal from the circuit is transmitted to an iPhone through Bluetooth. Several blood samples from a qualified Hospital were collected for access our hardwares and enzyme IDEs. Our 2D printer consists of a constant-flow pump, motors, an Arduino Uno microcontroller. The printer’s user interface is based on a Windows software by Steamduino which support several file formats like CAD scripts or normal pictures. Imported files will be converted to 2D routes and transmitted to the microcontroller. The speed of motors and flow rate of the "ink" are controllable in the panel. Since the space between lead feet of IDEs is about 4 mm, the printer can reach an accuracy of 3 mm. The path-programmable printer offers more possibilities for developers to design on the level of electrodes. For example, separated areas of the chip can be modified with different enzymes. IDE (interdigital electrode) is composed of two interdigital electrodes with two connection tracks, on an insulative substrate. IDE is cheaper than normal electrodes and can work with low volumes of sample. The interdigitated configuration typically enhances sensitivity and detection limits. The IDE circuit is planted on a PET (Polyethylene terephthalate) platform. And circuits itself are covered with copper, nickel and gold (in a manner from inside to surface) to enhance the conductivity. The current in side IDEs are led out through a FPC (Flexible Printed Circuit) connector which fits to the size of IDE lead feet. Taking our 2D-printer’s precision into consideration, we designed our first generation of IDE (see Fig. 1). The part with black lines is 6×interdigital working electrodes, the green part is a counter electrode and the red part is a reference electrode. But in the first design, two interdigital electrodes in pair are linked to the same lead foot which significantly lower the space for further DIY. 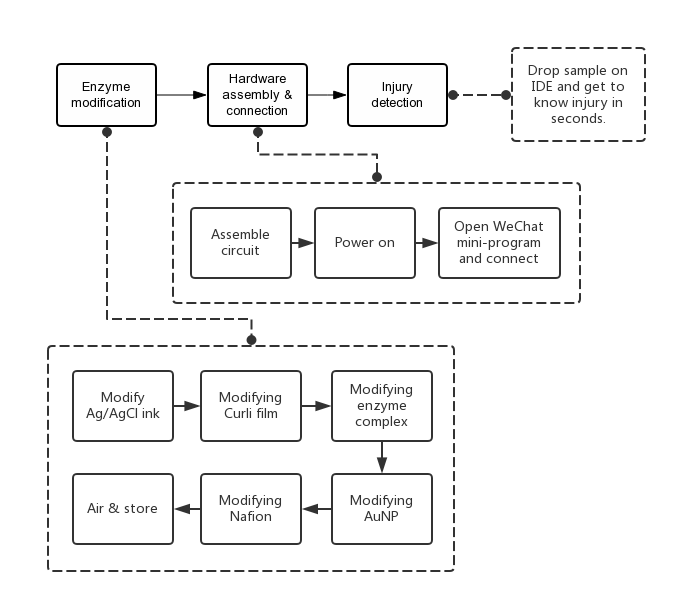 Fig 3.First generation of IDE. The part with black lines is 6×interdigital working electrodes, the green part is a counter electrode and the red part is a reference electrode. To make it easier to print protein solution to the surface and also for more possibility in further desgin, we modified our IDEs and create the second generation of IDEs (see Fig.2). In the new design, lead feet were enlarged to 0.44 mm. Gaps in between reached to 0.48 mm to avoid short circuit. And we separated each pair of interdigital electrode to 2 independent lead feet. Fig 4.Second generation of IDE. The part with black lines is 6×interdigital working electrodes, the green part is a counter electrode and the red part is a reference electrode. As the chemical reaction signal is normally small (10-7-10-5 A), a circuit which reaccepts the current signal must amplify the signal to a large voltage signal for sampling in microcontroller. And due to the characters of degenerative circuit, a convertor is needed for sampling subsequently. Fig 5. Integrated circuit design on amplifiers and convertors. We printed the "ink" containing modified enzymes on IDEs. IDEs' output feet are connected to the in-port of the second part hardware with a small current and circuits can accordingly form a voltage big enough to be sampled. 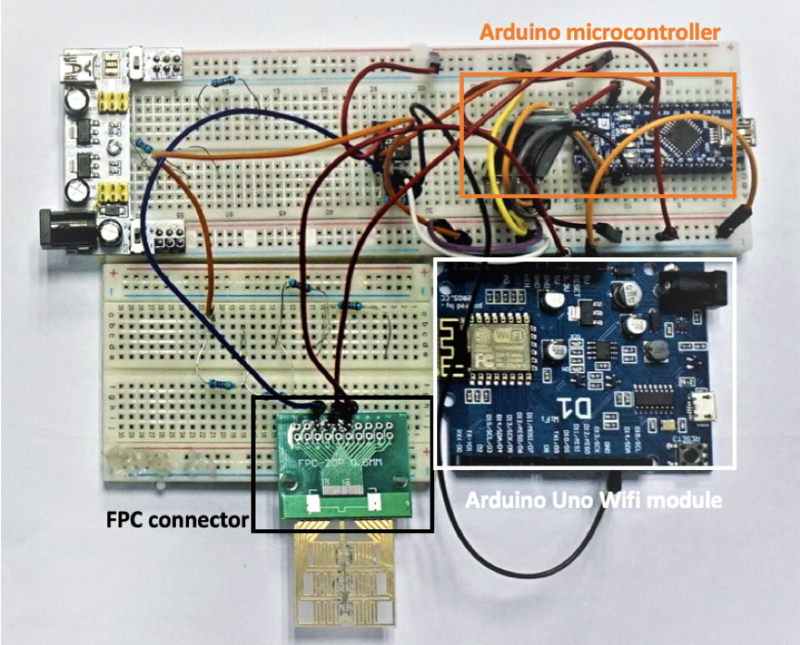 An Arduino Nano microcontrollor and a blueteeth module are used to transfer data to mobile phones running the WeChat (a well-known social media app) mini-program for visualization. Cell phones receive the voltage signal and transfer them into an actual current value by algorithm, and then send processed user-readable results to the applets. 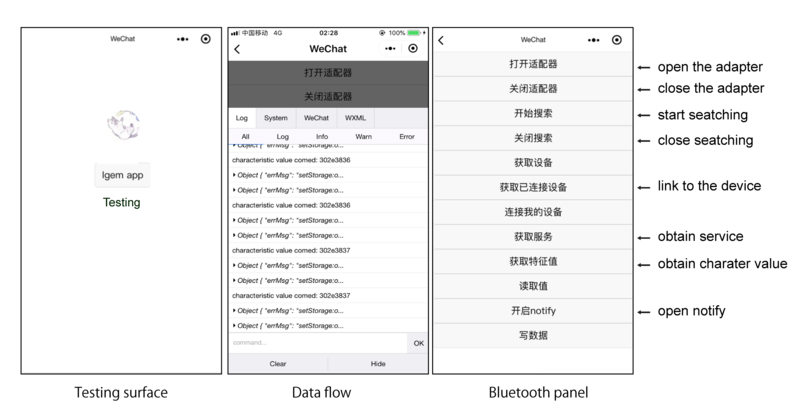 This app is developed in the WeChat Platform. Some screen shoots in the app are showed below. The hardware implementation not only solves the need to report wet experiment results, but also is much more user friendly, especially for non-professionals.In order to verify the stability and accuracy, we conducted dozens of tests in the hospital using real blood samples and contacted the experts to evaluate the hardware. In the figure showed below, the hardware model works well on distinguish patient samples and healthy samples. And the IDE chips response very quickly within 10s to plasma spacemen. But there is still limitation on whole blood detection. When applied with whole blood, the detaction time is lengthened and signals become very unstable. The modification is on schedule in the future plan. Gao, Wei, et al. "Fully integrated wearable sensor arrays for multiplexed in situ perspiration analysis." Nature 529.7587 (2016): 509.